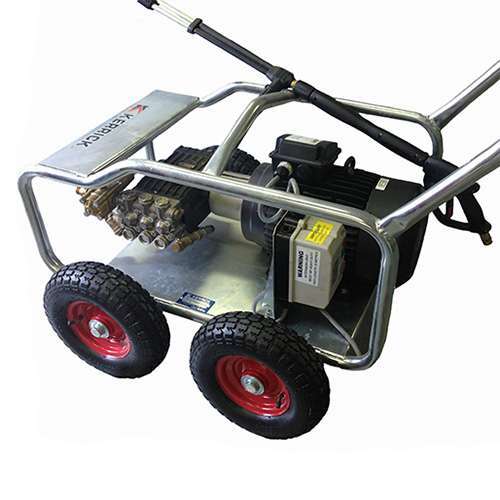 A compact, industrial, three phase pressure washer with a hardy galvanised frame, this unit has been locally designed and manufactured by Kerrick specifically for the Australian market. Features include a low speed motor, heavy duty pump, mounting plate for a high pressure hose reel and a thermal dump valve. This unit is ideal for heavy duty cleaning and industrial pressure washing applications. It’s also popular with the car detailing market due to it’s heavy duty nature and low speed pump. Car detailers tend to have the system wall mounted and run it off several 360° boom arms which allows operators easy movement and access to all areas of the vehicles they are cleaning.